From the incoherent riots of a disaffected youth to Russell Brand’s call to reject the ballot box, Britain has never been so jaded. Disempowered, disillusioned with the braying yobbery of Westminster’s ‘elite’, drained by the unpunished rate rigging and tax manoeuvring of banking and big business, we have hit a new low in political engagement. falsehood at the heart of this claim. The truth is that we’re far from apathetic – we’re just frustrated by the failure of our representatives to do their job. In this timely and innovative call to arms, Paul Twivy argues that this can be fixed – and the solution is not to reject voting. Rather, we need a drastic overhaul of our political system at every level, forging a new relationship between the people, the state and the corporate world. 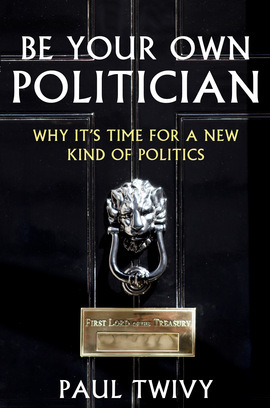 Radical, entertaining and thought-provoking, Be Your Own Politician maintains that a newly energised, politically engaged society really is ours for the taking – and shows us how to claim it. I really enjoyed the insider’s account of the failure of the Tories’ Big Society idea as well as the description of the endless frustration of attempting to engage previous governments in effecting social change. [Twivy] brilliantly portrays the ups and downs of fighting for change.